Cut through majestic pine trees and around stunning blue lakes, Aroeira has two championship golf courses that were designed by some of Europe's greatest architects, and have played host to a number of European Tour events. It is rare for a golf club to boast two courses of such outstanding quality, with both the Aroeira 1 and Aroeira 2 ranked in Portugal’s top 30 courses. Located just 30 minutes south of Lisbon, one of Europe’s coolest cities, Aroeira Resort is very accessible for UK golfers. The resort is set in a beautiful pine forest right by the coast, in view of the golf courses, making the perfect setting for your golf break. The Villa accommodation is first-class, providing privacy while having everything you need on site. Aroeira I opened for play in 1973, having been designed by Frank Pennink. 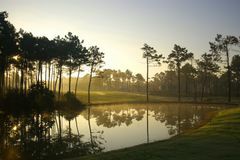 Since then, the course has steadily built up an impressive reputation, culminating with the award of the Portuguese Open in 1996 and 1997 and more recently the International Portuguese Amateur Championship Gentlemen & Ladies (2010 & 2011). From the championship tees, Aroeira I reaches 6,609 yards, and set amidst some 900 acres of beautiful pines, is a stunning location for a game of golf. The highlight of Aroeira I course is the par 3, eighth hole which amasses to 208 metres. At stroke index 3, this is a particularly challenging hole and requires a long iron to a green with a remarkable inclination, which slopes sharply to the left and is protected by a large bunker on the right. With the inauguration of the second course in the year 2000, Aroiera was confirmed as one of Portugal's premier golfing destinations. Aroeira II was conceived by Donald Steel, the man responsible for so many outstanding projects both in the UK and abroad, and has been earmarked for future Portuguese Opens. The course winds its way around several lakes, and with a variety of tee markers on offer, it remains playable for golfers of all standards. Aroeira has an excellent golf academy, where you can seek the advice of the expert PGA professionals or simply work on a few of the game's finer points. The raised tee on the 11th requires a tee shot onto a narrow fairway with trees on both sides and a slight dogleg to the left. A slight draw would suit this hole well. The approach shot gives a quite stunning view onto a green closely protected by water and bunkers to the front and to the left. Located in the stunning pine forests that characterise the resort, the Aroeira Villas offer comfortable accommodation in a stylish and convenient environment. The apartments range in size to suit every demand, and all are complete with a fully-equipped kitchen, bathroom, living area with satellite television, and a private balcony. The accommodation is located perfectly for access to the golf courses, which are the real highlight of any stay at Aroeira, and with the attractions of Lisbon and the local area on the doorstep, there is no doubting the quality on offer here for your next golfing holiday on Portugal's Atlantic coast. Guests at Aroeira are free to make use of the fantastic outdoor swimming pool (open from June - mid September), while there are four well-surfaced tennis courts that are ideal for a knock around, while the more serious players can take a lesson from the resident professional. Na Ordem is one of Lisbon's most revered dining rooms, where chef Luis Suspiro creates masterful dishes that are as beautiful as they are tasty. For a quiet beer, head to Esplanada do Adamastor, where you can relax and enjoy the views of the river. Those in search of a more lively night out might enjoy Fluid Bar, whose stylish space is filled with designer chairs. We had an apartment alongside Aroeira 2 fairways. The apartment was very tired as was the outside. Paving slabs broken and dangerous. Only one shower which you had to hold. curtain rail broken in one bedroom. OK to sleep in but that was about it. A long drive to club house and the few shops on the site. A car is imperative as very difficult to get a taxi. great course, fairways were average, greens were perfect! An interesting course with some good holes but it was not presented in good condition. We were not made aware that the two courses at Aroeira are a kilometre apart, leading to transport problems between the clubhouse and Aroeira 2. The course was poorly presented and not one we would choose to play again. No clubhouse so you had to go to a green shed to find the caddy master. no clear signage. Apart for a couple of greens which had a bit of GUR the remainder were fine. Much better than Aroeria 1. lots of bunkers and water which came into play. A good challenge. first time on so would love to play it again as placed a few shots incorrectly not knowing the holes. No bar/ facilities so back to 1 club house. As said earlier you need your own transport as courses are a long away apart from each other. A bit boring as most were straight fairways with no bunkers apart from a few around the green. A wee bit tight but if hitting straight you can score well. Not too sure how they can call this a championship course. Mixed condition - very bare in places and over watered in others. No driving range.